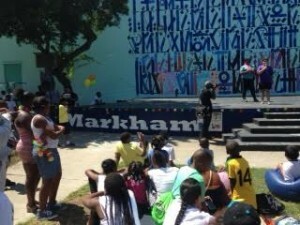 Beyond Bullies was invited to speak to counselors and campers at Markham Summer Camp. Campers were struggling with bullying, specifically, LGBT, name-calling and boy-on-boy aggression. During the presentation to girls, when we were addressing bullying strategies, a camp counselor said when a target of bullying goes up to a bully and asks them why they’re spreading rumors; fist fights will most likely ensure. The camp coordinator described these kids living in a dog eat dog world, where violence prevails. The camp is situated in Watts, which is a predominately African American community, which has a number of gangs bordering the campus. During the 2-day camp training, counselors and campers were shown strategies that encouraged students to use their minds and hearts to get ahead in a where world physical altercations can result in targets of bullying being suspended, especially when bystanders just stand by without intervening.